Among all of the assortments Chicago Steak Company has to offer, this is their Best Selling one. An assortment that allows you to sample the best cuts of steak; tender Filet Mignons, succulent Boneless Strips, mouthwatering Ribeyes and flavorful Top Sirloins. Whether you prefer tender, lean, or well marbled steaks this Best Seller includes all of those choices. The steaks are certified USDA Prime or upper-1/3 USDA Choice, putting them in the top 2 percent of beef worldwide. Each steak is hand-selected and hand-carved by butchers with five generations of experience to ensure you get the best cut possible, and then wet-aged to intensify its naturally delicious flavor. 2 (8 oz.) 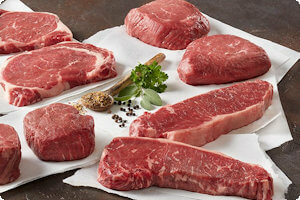 Premium Angus Beef Ribeyes - more fat and marbling, with an amazing flavor. Everyone has their personal preference, so why not give them all a try.